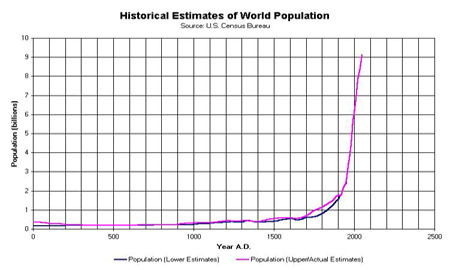 Their Haber-Bosch process has often been called the most important invention of the 20th century (e.g., V. Smil, Nature, July 29 1999, p 415) as it “detonated the population explosion,” driving the world’s population from 1.6 billion in 1900 to 6 billion in 2000. Under high temperatures and very high pressures, hydrogen and nitrogen (from thin air) are combined to produce ammonia. Nearly one century after its invention, the process is still applied all over the world to produce 500 million tons of artificial fertilizer per year. 1% of the world’s energy supply is used for it (Science 297(1654), Sep 2002); it still sustains roughly 40% of the population (M. D. Fryzuk, Nature 427, p 498, 5 Feb 2004). This was written by synthum molyart. Posted on Saturday, October 13, 2007, at 4:12 am. Filed under From The Field, Jai Note. Tagged Ammonia, artificial fertilizer, awareness expansion, Ecodelics, future, Gaia, Haber-Bosch, math, media ecology, Peak Energy, Peak Food, Peak Minerals, peak oil, phosphorus. Bookmark the permalink. Follow comments here with the RSS feed. Post a comment or leave a trackback. ‹ Iran labels CIA ‘terrorist organization’ by Ali Akbar Dareini.